1 Department of Pediatrics, Alexandria University, Faculty of Medicine, Egypt DOI : 10.24953/turkjped.2017.02.004 El-Nawawy A, Moustafa A, Heshmat H, Abouahmed A. 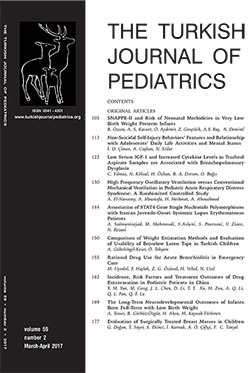 High frequency oscillatory ventilation versus conventional mechanical ventilation in pediatric acute respiratory distress syndrome: A randomized controlled study. Turk J Pediatr 2017; 59: 130-143.